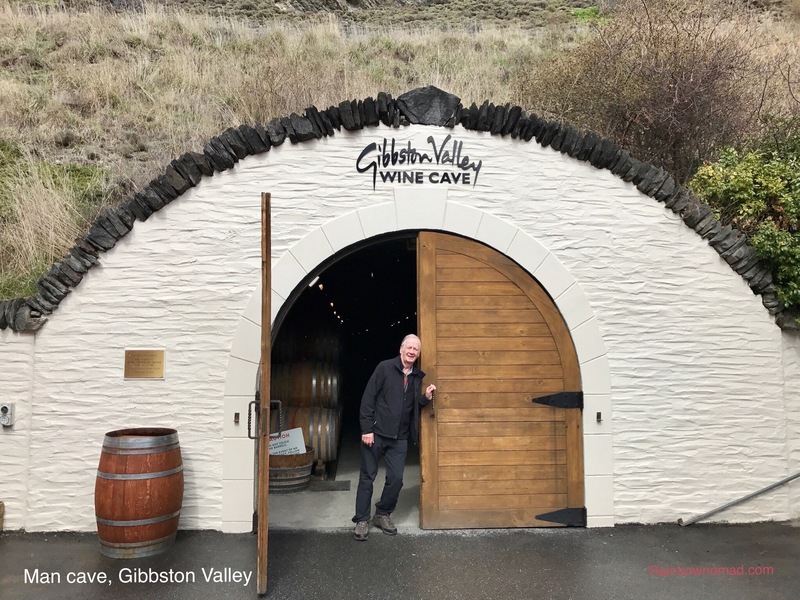 Wandering from Queenstown to Wanaka along the Kawarau River gorge involves stopping at various wineries. Our first stop was the Gibbston Winery and Cheesery. Here we tasted various aromatic wines and devoured a Gibbston Cheese platter of 3 cheeses of our choice. 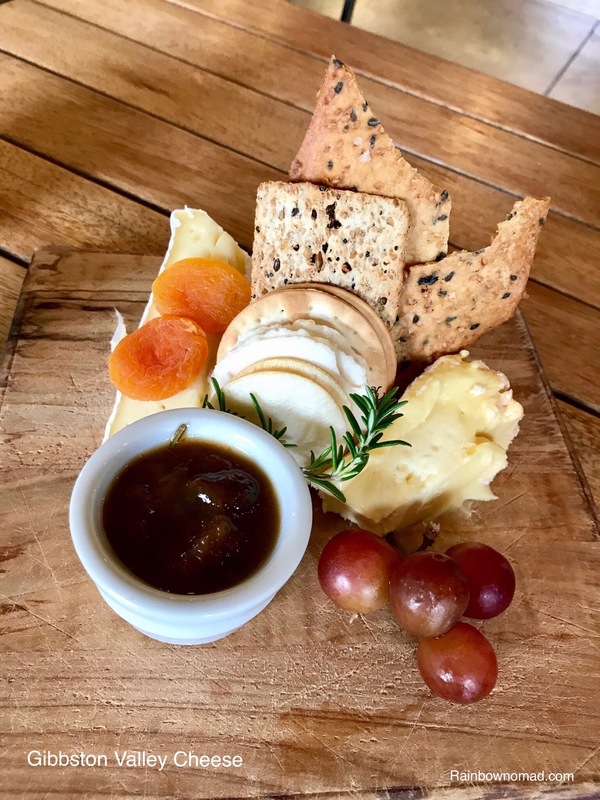 We tried the washed rind Brie, goat’s milk Gouda and a Brie, the favourite being goat’s milk Gouda. Gibbston is also renowned for its mountain bike trails and we did see a couple of mud spattered cyclists adjourn for wine tastings. Our next stop was Peregrine Winery and we left clutching a bottle of Rastaburn Riesling, after sampling a great range of wine in their design awarded cellar. 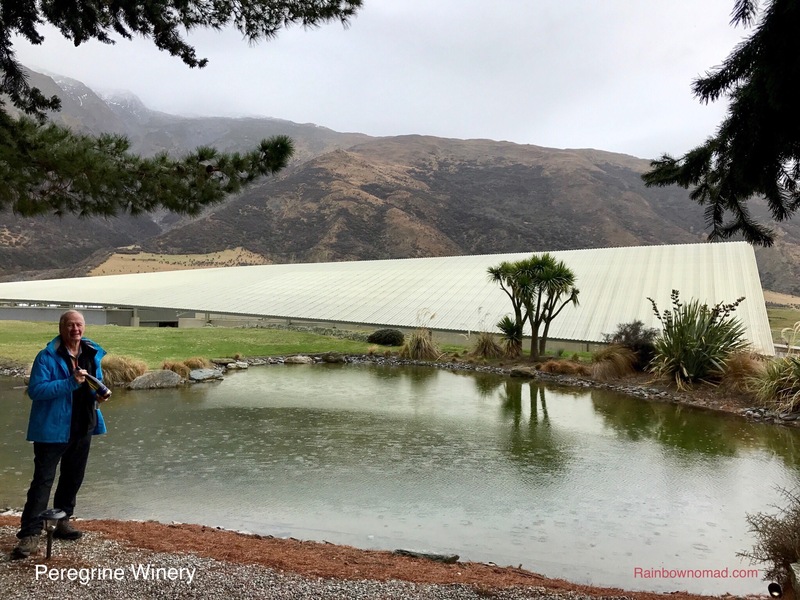 Our route to Wanaka via Cromwell passed the Queensbury wine growing area, where our Riesling grapes were sourced and we drove into town as the sun was setting over Treble Cone and the Mt Aspiring National Park. 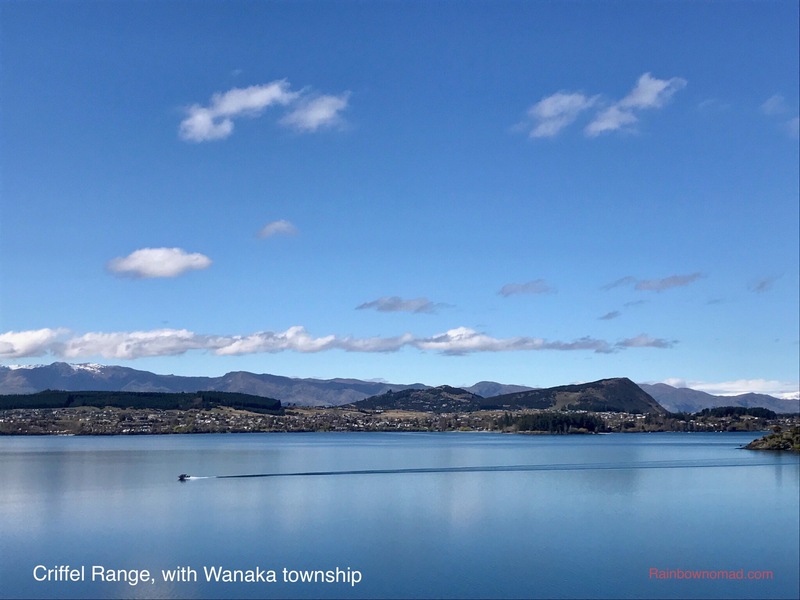 Wanaka retains many memories of my hitchhiking adventures with my 18 year old sister in 1970. 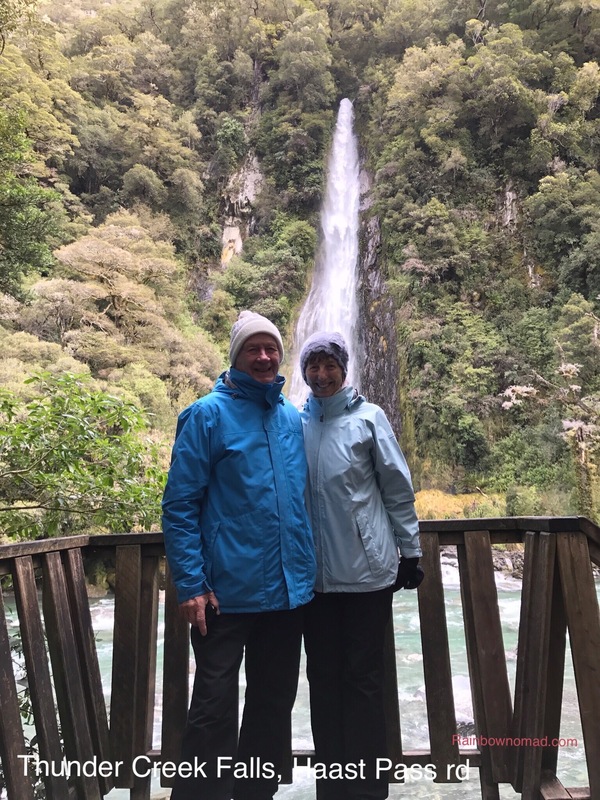 We travelled the whole length of the country from Cape Reinga in the north to Invercargill in the south but hitching over the Haast Pass to Wanaka remains a highlight. At that time, the road had only just been converted from a rough track to a formed gravel road. It was a wild ride in a ute with two young fishermen. The Pass itself is 562m above sea level and is the lowest of the three crossings of the Southern Alps. 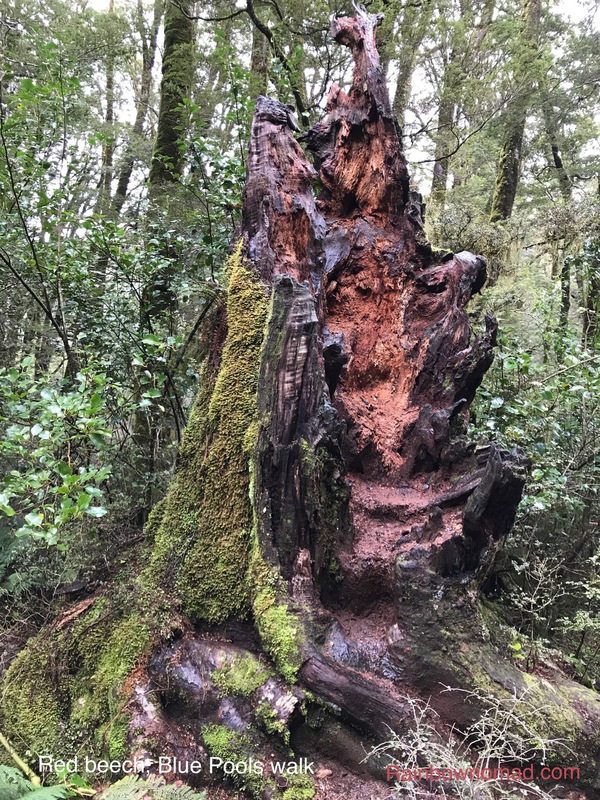 The gradient on the Western side is 1:4.5 – I looked it up and it’s steep – and the whole journey from Makarora on the east to Haast in the west follows virgin beech forest. We decided to travel up to the Pass to walk to the Blue Pools. 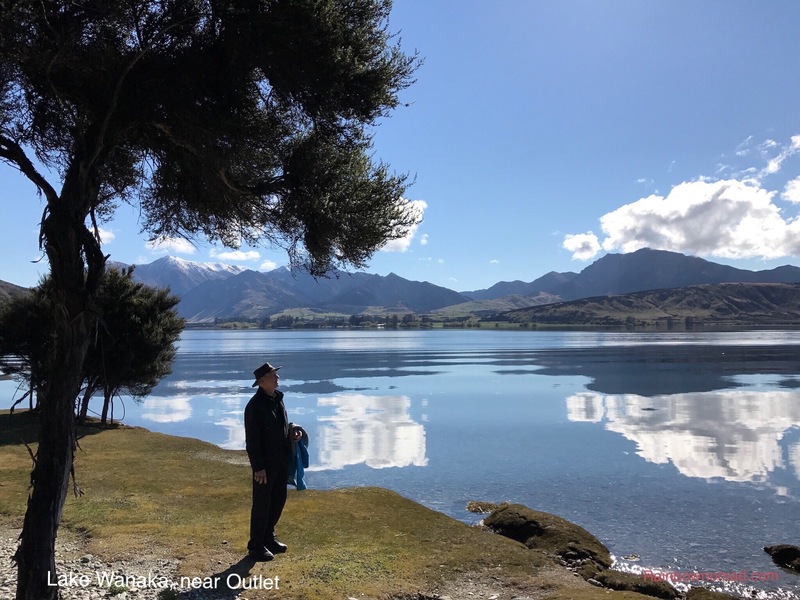 The road is now sealed and firstly travels along Lake Hawea before crossing a saddle and snaking along the northern edge of Lake Wanaka. Drizzle and low cloud obscured the ranges on either side of the lake. The temperature remained at about 6 degrees. Stopping at Makarora, we saw deer up to their knees in mud. Lunch stop at Cameron’s Flat revealed a plaque informing us that the German geologist Julian Haast is said to have been the first European to traverse the mountains in 1863, however there is evidence that the Scottish prospector Charles Cameron may have beaten him to it. Haast and his party apparently returned starving, with ripped clothes and bare feet! Early Maori called the path Tioropatea or Clear Path and would certainly have guided these Europeans. The forest of red and silver beech was now familiar and closeting. 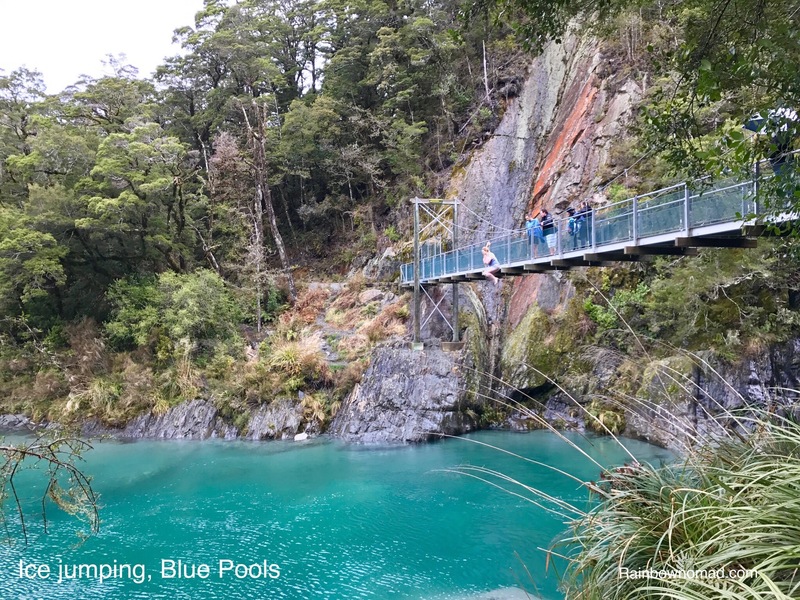 We reached Blue Pools along a well developed path and swing bridge. 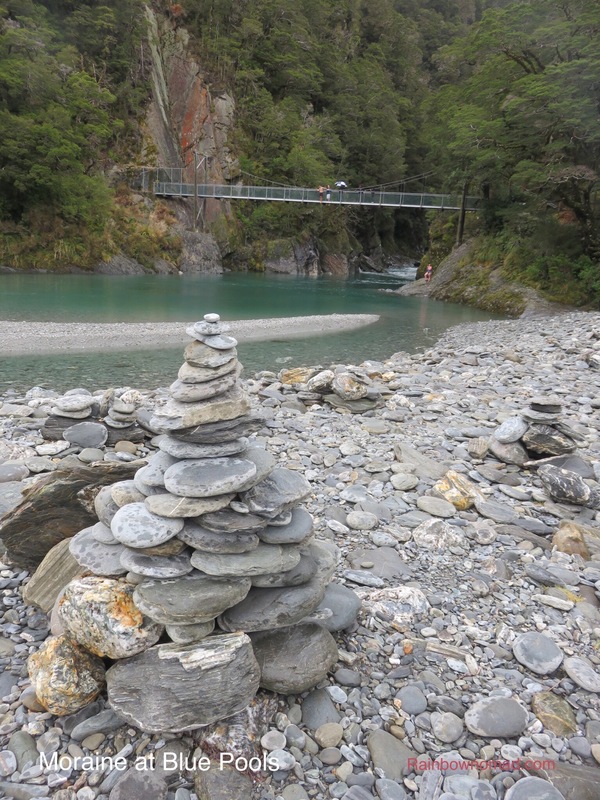 The water flowing out of the Blue River into the Makarora is indeed glacial blue, with thousands of smooth grey moraine rock, littering the banks. A crazy crowd of Aussies were jumping and diving over 12 metres from the swing bridge into the icy water below, emerging speechless with cold. Later, after they left we saw huge trout in pools below the bridge. Deciding against the 400m climb to the summit at Haast Pass, we headed through the Gates of Haast, down the 1:4.5 gradient toward Thunder Creek Falls on the western side. The wind picked up and the whole journey seemed increasingly treacherous especially as we passed several runaway vehicle bays, until we reached the safe haven of the forest around the falls, which was certainly worth the trip. The following day could not have been more of a contrast. Dawning fine and sunny, although still below 10 degrees, the mountains were totally clear. Our first walk along the lake took us to the Outlet where we looked across the Peninsula to Mt Burke and Mt Maud. 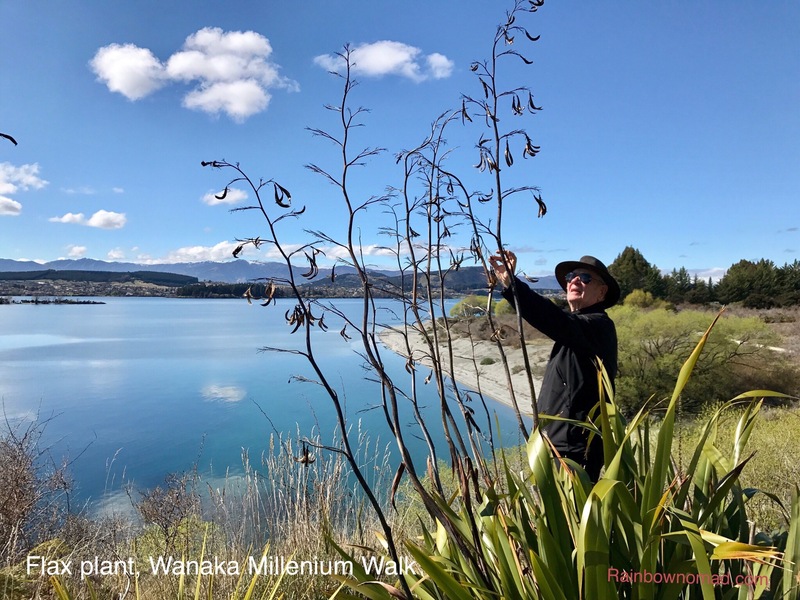 We then took a packed lunch to the other side of the lake and did part of the Wanaka Millenium Walk from Waterfall Creek to Glendhu Bay. 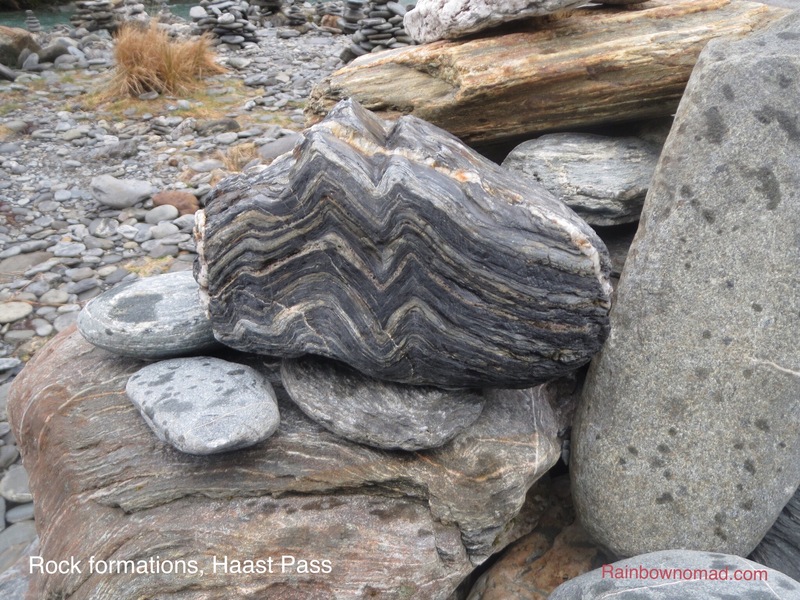 Wanaka township is built on moraine, a chaotic jumble of boulders, gravel, sand and silt left behind after the last retreat of two glaciers, about 12,000-15,000 years ago. The glaciers dumped the moraine forming the dammed lakes Wanaka and Hawea. The waters recede back and forth in a tidal fashion, purely fed by the northern rivers and snow run off. 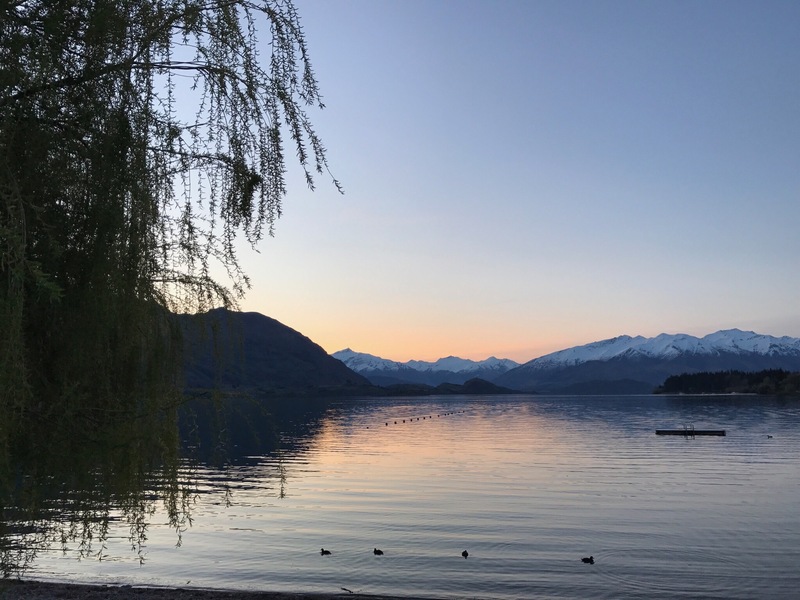 Criffel Range which extends behind Wanaka continues to rise about 0.5-1mm/year and 15 million year old river gravels have been found on top of the range. We enjoyed our simple bread and cheese lunch overlooking the lake. 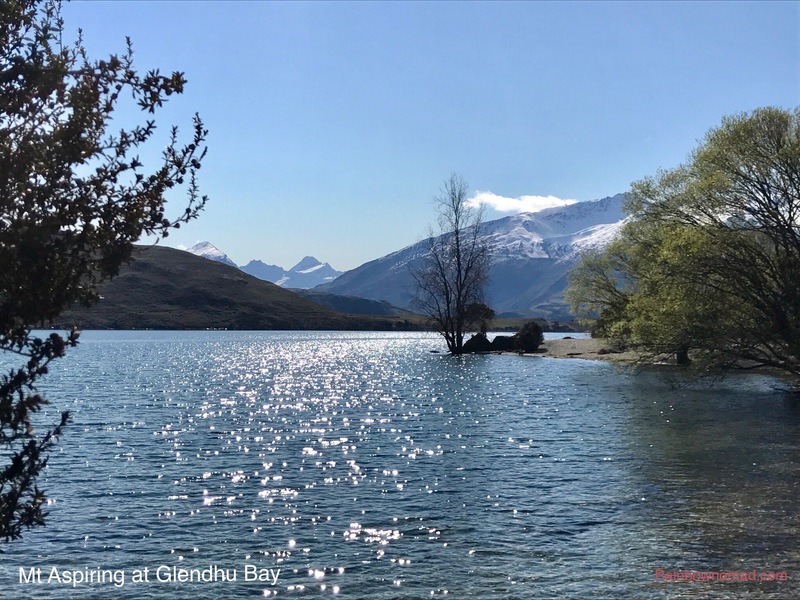 On the western side of the lake at Glendhu Bay, the peaks Treble Cone, Mt Black and behind them, the 3033m high Mt Aspiring form part of the Mt Aspiring National Park over over 3555 sqm of wilderness with over 100 glaciers. 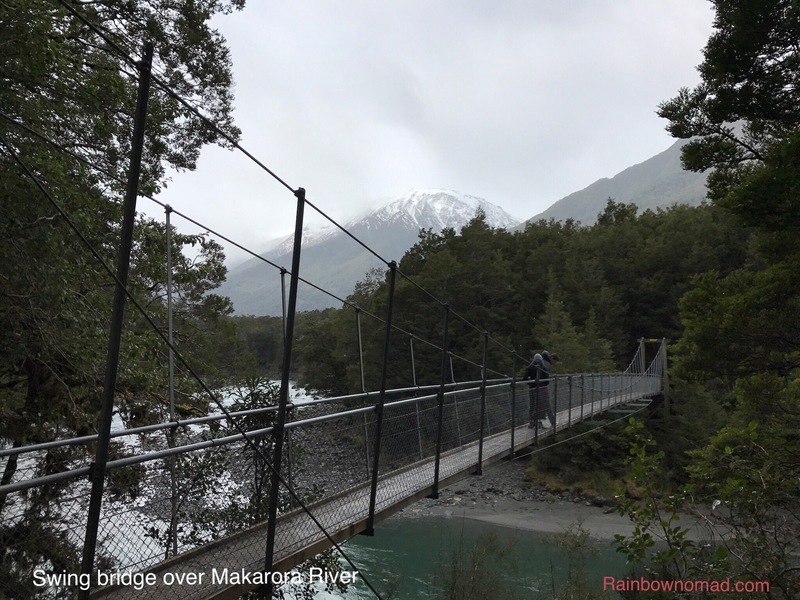 It is part of the World Heritage Area Te Wahipounamu – Southwest New Zealand, which includes Fiordland in the south, Westland on the west coast and Aoraki/Mt Cook to the north. It is undoubtedly stunningly beautiful country. Sue your word pictures AND the photos are just wonderful. This is all worthy of publishing. What totally memorable experiences. Thank you for sharing it all.